We love what Murcia has to offer and especially the vast amount of beautiful Murcia property available! Also known as Costa Calida or the ‘Warm Coast’, the area encompasses all the benefits of the Spanish lifestyle whilst being affordable! We’ve pulled together our A-Z of Murcia – we think you’ll fall in love with it too! Both Murcia and Alicante Airports operate all year round and many budget airlines offer cheap daily flights from all over Europe! You’re normally no longer than an hour away from your Murcia property which means it’s easier than ever to visit throughout the year. With approximately 320 days of sunshine a year, life’s a beach! With the choice of many beautiful sandy beaches in close proximity, you can enjoy relaxing, exploring or taking part in watersports to keep you entertained! The historic port town of Cartagena has been operational for over 2,000 years and is home to many museums and architectural treasures. Most of its oldest monuments date back to Roman times, including the Roman Theatre of Carthago Nova and Cathedral ruins of Cartagena. The weather in Murcia is amongst the hottest and driest in Europe and offers many health benefits! Aside from helping those who suffer from S.A.D. (read our article about Neida’s experience here), the climate is well known to aid people with rheumatism, arthritis, asthma and heart-related problems (The World Health Organisation). If the scenery doesn’t sway you to own a Murcia property, the famous ‘Mediterranean Diet’ surely will! The cost of fresh fruits, vegetables and meats are noticeably lower than in the UK and are more often from local sources. Eating out is a truly fantastic experience with many of the independent restaurants priding themselves in offering a variety of cuisine including the traditional paella and tapas dishes, all freshly prepared! The abundance and variety of seafood available from the Mediterranean is exquisite! Purchase from your local food market and cook up yourself, or enjoy an evening at a local coastal restaurant. Many golfers choose a Murcia property solely to make use of the fantastic golf courses in the local area! With over 15 local courses, including Roda Golf and El Valle Golf, you can enjoy many games which all have luscious grounds and beautiful garden surroundings. Not to mention the friendly clubs and resorts which are great for getting to know the locals! Property in Murcia benefits from beautiful settings which means you have access to many walking and hiking routes. These routes are suitable for all ages and tastes including wine routes, coastal paths, ecotourism and cultural options. Remember to bring your camera with you! I – Inexpensive cost of living! Thanks to the locally sourced food and low energy needs, the costs of owning a Murcia property is low. Most developments benefit from low running costs and communal fees. The nature parks and gardens in Murcia offer tranquil areas for a peaceful walk or picnic. Many are home to landmarks and beautiful gardens with ancient trees. Our favourites include Jardin de Floridablanca, Jardin de La Seda and Jardin del Salitre. Your Murcia property is a great base for your children or grandchildren as most developments have great communal pools and large landscaped gardens to enjoy! Plus, there are many local parks, watersports and beaches to visit. Imagine having this 5 star luxury resort on your doorstep? The club is renowned for its three 18 hole golf courses which are surrounded by lush gardens. Along with its world-class accommodation and close proximity to the shores of Mar Menor, it’s certainly a hot spot! The wonder that is the Mar Menor – The sea water lagoon sits between the Mediterranean Sea from La Manga and is separated by a 22km strip of land which varies in width from 100 metres to 1,200 metres. The lagoon is Europe’s biggest and is perfect for bathing thanks to the warm, clear water which is no more than 7 metres in depth. Spanish Legal Homes have offices and showrooms in the local area that are open to your dispense! Check in with us when you need, we’re here to help! The towns that populate Murcia each have their unique style, from the more traditional architecture with properties decorated in flower pots, to the incredible modern developments and resorts. The level of expat communities differs from town to town, with some highly populated with families from the UK and European countries and others with a higher Spanish community. R – Retire with health! If you’ve thought about retiring in Murcia but are worried about the uncertainty of your health, your mind can be put at ease! The excellent healthcare service in Spain provides exceptional medical care and 24-hour pharmacies offering medical advice with on the spot services. Why not embrace the Spanish lifestyle and enjoy Sangria and Siestas? The traditional resting period is still very popular amongst communities. It is easy to get around the local areas from your Murcia property! You will be close to the local airports and the motorway network in Spain is excellent. Plus the help from low cost local public transport makes travel simple. Have you been dreaming of moving to Spain? Why wait? Moving to Spain can be a hugely rewarding experience and one you wish you made sooner! With the help of a reputable Spanish property agent like Spanish Legal Homes, the process to buy a Murcia property is smooth. Our bilingual expert team will welcome you to the area, show you around and help get you moved in. Views of the salt lakes, coastline, sea, golf courses, landscapes… the list goes on! Many Murcia properties have sun terraces or roof solariums which offer picturesque views of the local area. Why not spend an evening watching the sunset from your Murcia property? Enjoy some of the best tasting local wines during your time in Spain! Top tip: ask the waiter for their recommendations as some restaurants have impressive wine cellars, including one with over 10,000 bottles! X – Xtreme water sports! La Manga and other local beaches offer many water sporting activities from jet skis, wakeboarding and ringos. There are also many opportunities for a peaceful boat trip along the coastline. There’s an activity for everyone! Take some time away and relax in the sun! Whether that’s on your Murcia property, at the beach or at a local spa, the stunning weather makes it easy to drift off. The Terra Natura Murcia is home to over 400 animals including Giraffes, lions and birds of prey, from the African Savannah and the Iberian Peninsula. In the summer months, spend the day at their aquapark which is full of water slide and rapids – great for entertaining your kids or grandchildren. If you like the sound of Murcia and are interested in viewing Murcia property, please do not hesitate to get in touch! 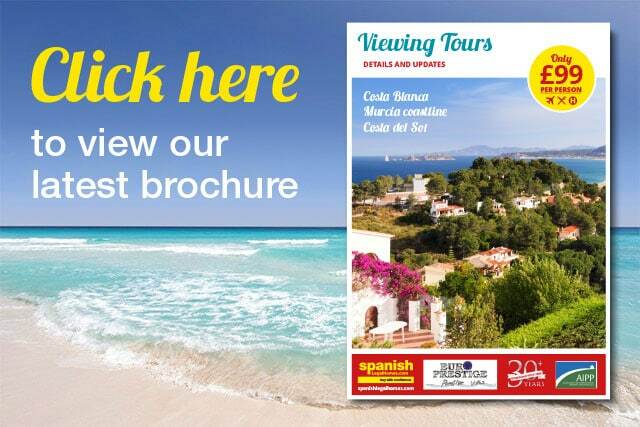 Our viewing trips to Murcia offer an inclusive trip to view property in your budget and the local area. You can learn more about our viewing trips to Murcia here. Want to book your trip? Call our expert team on 01202 971614 or email sales@epspain.com.